This tropical paradise can be found on the west side of the island of Kauai. If you're a surfer, then you've probably tried surfing Pakalas Beach which is near Makaweli Camp where I got the inspiration for this painting while taking a long hike on the beach with my good friend. 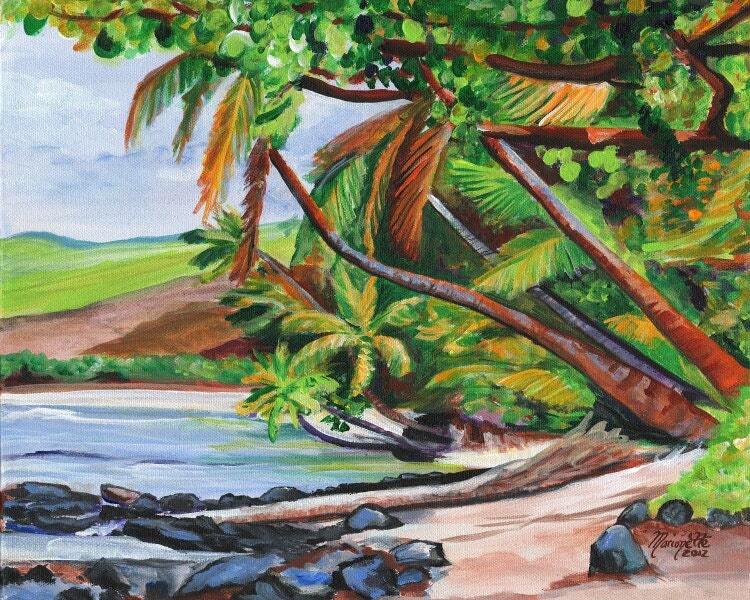 "Makaweli Tropical Landscape" This giclee print is signed by the artist and is printed with archival inks on radiant white watercolor paper. It is a reproduction of an original acrylic painting and comes packed in a clear sleeve with a backing board (unframed). Colors may vary slightly from monitor to monitor. After a family trip to Hawaii, we were looking for artwork that captured our amazing experiences. I ordered a series of prints from this vendor. They are even more stunning in person and far exceeded my expectations. Thank you so much for bringing a smile to our faces every day! I love this painting, was going to give it as a Christmas present but I'm having second thoughts..might look good on my wall!